Home › Announcements › 100 years of Silpi – the artist who painted like a sculptor! 100 years of Silpi – the artist who painted like a sculptor! 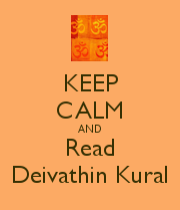 Thanks to The Hindu and Sri Karthik Sudarshan for the share. The very name Silpi evokes awe even as it conjures up lively water-colour images of deities in sanctum sanctorum and 3D-like line drawings of temples and their sculptures. The birth centenary of P.M. Srinivasan — who was conferred the title ‘Silpi’ by his guru Mali (T.R. Mahalingam) because he painted like a sculptor — passed on January 19 without notice. “He is one among the five great masters — including K. Madhavan, S. Rajam, Maniam and Gopulu — who evolved a unique style from the native tradition and culture and without any foreign influence. Silpi could produce 3D effect in his paintings which is otherwise possible only through a camera,” said noted painter Maniam Selvan. Silpi had a flair for the brush even as a child and his talent was spotted by freedom fighter and poet Namakkal Ramalingam Pillai. But Silpi’s father Mahadeva Iyer, who had a thriving timber business in Namakkal, rejected the idea of training him as a painter since he wanted his son to join government service. “But change in family fortunes forced my grandfather to agree to the proposal of Ramalingam Pillai after a few years. The poet took my father with him to Chennai and admitted him in the School of Arts and Crafts,” said S. Mahalingam, son of Silpi. An extraordinarily talented Silpi completed the six-year course in four years. “At a time when line drawing was still unknown in India, my father excelled in the genre. If he drew a scene at the Central railway station, he would be there till the last light and would resume the next day. He would create a scene as he saw it and would never allow his imagination come in the way,” said Mr. Mahalingam, who was named after his father’s guru Mali. Silpi’s paintings were featured in all leading magazines, particularly in Ananda Vikatan , Kalaimagal andBhavan’s Journal. 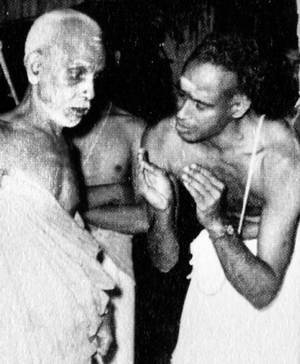 He turned his attention exclusively to temples and deities on the advice of Chandrasekarendra Saraswathi, paramacharya of Kanchi Kamakoti Peetham. “Periyava (the Sankaracharya) told my father that since devotees did not visit temples as they used to, you have to ensure that the deities reach the houses of devotees through your paintings,” recalled Mr. Mahalingam. Silpi was allowed to sit in the sanctum sanctorum of temples for hours to paint. He even had access to jewels of the temples to get an idea of nuances and on a few occasions he himself decorated the deities before drawing them. “His painting ensured that we worshipped the deities at home without the push and pull of the crowd in the temples. Once I visited his exhibition in the P.S. School on the advice of my father. I was stunned by the panoramic view of Madurai temple, which he had drawn sitting on the temple tower,” recalled Mr. Selvam. “He explained that he would cover one portion in one sheet and another portion on another sheet and finally merge them. The foreground, middle ground and background with the depth of the field found expression in his work. It was possible only for the only and one Silpi,” remarked Maniam Selvam. Greatest painter !! No words to describe him. 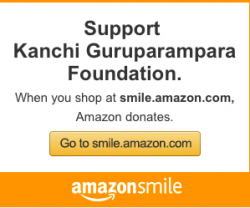 With blessings of Shri MahaPeriyava he was able to scale great heights. I am an ardent fan of Srimam Silpi right from my school days, and also of Sri Maniam,and Sri Gopulu, They have been my Maanaseeka Gurus. Their line drawings. Watercolour paintings and pencil shade drawings were my practise materials. I still keep all those reproductions done during my school and college days. I, like many other lakhs of readers will always relish those 40,s,50s and 60s of their dominance in the once famous Tamil magazines which have stopped to the level of trash magazines due to commercialization. Sri Silpi passed away in January, 1983. He was extraordinary in both his artistic talents and their expression. When art is dedicated to divine purpose, it not only begets delight, but bestows blessings, as we experience in Carnatic music and Bharata natyam. Sri Silpi’s art belongs to that exalted category. Silpi’s talent was that he combined the techniques of painting/line drawing with the eye of the photographer. But behind these was the divine vision-to see things beyond what the mere physical eyes could behold. Hence the extraordinary feelings we experience when we view his drawings of temples and their sculptures: we feel as if we stand before the very temples and deities and our hands involuntarily join in making instant obeisance. Silpi’s art took us beyond the merely aesthetic, beyond the intellect, to the very realms of spirituality! 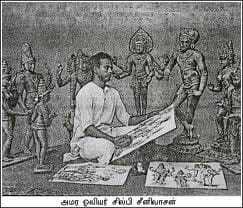 Silpi drew thousands of drawings which appeared in those old time Tamil periodicals, now lying scattered. Fortunately for us, hundreds of his drawings which appeared in Ananda Vikatan from January 1948 to April 1961 have been brought together in two delightful volumes titled “தென்னாட்டுச் செல்வங்கள்” [ Treasures of the South] by Vikatan Publishers. Though printed on only glazed newsprint, these bound volumes are a delight to hold and behold, and a treasure to cherish for years. The volumes contain the original essays/commentary that accompanied the drawings when they were published. This shows that Silpi was not only an artist but a rasika, proving the validity of our classical yardstick for appreciating fine arts: ‘Raso vai saha’. Such a combination of great talents is undoubtedly a divine gift. That Silpi dedicated it totally to divine purposes shows the nobility of the person. So, appropriately Gopulu, another talented artist and colleague of Silpi has called him “64th Nayanmar”, in the introductory note to the book. Most of us may not be able to visit the temples that he covered and view the original sculptures that he drew. And unfortunately. many of the temples continue to be neglected, and many of the sculptures are passing into obscurity, some are even being destroyed/obliterated in the very name of restoration or renovation of the temples! So, Silpi’s drawings will defy time and stand as authentic record of our temple architecture and sculpture. It is an extraordinary situation: that his drawings will stand as monuments to the ancient temples. Silpi’s divine art has made him immortal, like the temples he drew! Blessed soul indeed. All the Greats have already passed away in to Heritage. Be it in the realm of spirituality, public life, profession. Ramana, Mahaperiava in spirituality Radhakrishnan, Rajaji, Viswanatha sastri likes in public life, maharajapuram viswanatha iyer, MS in music, Audrey Hepburn likes (name spelling excuse) in art known for humanitarian causes too. All we have now is technology enabled stereotypes only as imitations.